Santa Claus Is Comin' to Town is a 1970 stop motion Christmas television special produced by Rankin/Bass Productions. The film stars Fred Astaire as the narrator S.D. Kluger, Mickey Rooney as Kris Kringle / Santa Claus, Keenan Wynn as the Winter Warlock, and Paul Frees in various roles. The film tells the story of how Santa Claus and several Claus-related Christmas traditions came to be. It is based on the hit Christmas song "Santa Claus Is Comin' to Town", which was introduced on radio by Eddie Cantor in 1934, and the story of Saint Nicholas. The special was created using Japanese stop motion animation called "Animagic", in which all the characters are made out of wood and plastic and animated via stop-motion photography. The special was originally telecast December 13, 1970 by ABC and continues to air every year on sibling channel ABC Family (now Freeform) though both channels have at times edited the special to make room for commercials (ABC has cut two key songs, as well as two other songs in half; ABC Family/Freeform has cut several scenes that they believe may be traumatizing to younger viewers, like Kris climbing, and leaping to escape to prevent children from doing dangerous stunts, Winter Warlock knowing Kris will return, and telling him he will never escape including the scene where the Burgermeister torches the seized toys in front of the children of Sombertown). The DVD releases include these deleted scenes vital to the story's plot. Special Delivery "S.D." Kluger the mailman (voiced by and resembling Fred Astaire) is introduced after a newsreel prologue, telling how children around the world are preparing for Christmas and Santa Claus' arrival. When his snowmobile/mail truck breaks down, he tells the story of Santa Claus, answering the children's letters to Santa. The story begins in the gloomy city of Sombertown, ruled by the evil abusive and ill-tempered Burgermeister Meisterburger (voiced by Paul Frees). A baby arrives on his doorstep with a name tag reading "Claus" and note requesting that Burgermeister raise the child. He instead orders his lawkeeper Grimsley (also voiced by Paul Frees) to take the baby to the "Orphan Asylum". On the way there, a gust of wind blows both sled and baby to the Mountain of the Whispering Winds, where the animals hide him from the evil Winter Warlock (voiced by Keenan Wynn) and convey him to an Elvish family by the name of Kringle in Rainbow River Valley. Led by Tanta Kringle (voiced by Joan Gardner), the elf queen, she and the five Kringle elf brothers (Ringle, Dingle, Zingle, Tingle and Wingle, all voiced by Frees) adopt the baby and name him "Kris". A few years later, Kris hopes to restore the Kringle family as "The First Toymakers to the King". When Kris is old enough, he volunteers to deliver the elves' toys to Sombertown. Unfortunately, the Burgermeister has banned all toys from the town after tripping on a toy duck left on the steps of the city hall, and declares that anyone found possessing a toy will be imprisoned. On his way to Sombertown, Kris meets a lost penguin whom he names Topper as they evade the Winter Warlock who vows to catch him the next time he passes. In the town, he offers toys to two children washing their stockings by a water fountain. He is stopped by Miss Jessica (voiced by Robie Lester), their lovely schoolteacher, but she softens toward Kris when he offers her a china doll as a "peace offering". As Kris gives more toys, the Burgermeister arrives to arrest the children, but Kris gives him a yo-yo. He at first happily plays with it, but Grimsley reminds him he's breaking his own law, leading Burgermeister to order Kris' arrest. As Kris and Topper return to the Kringles, the Winter Warlock captures them with the help of his tree monsters. But when Kris gives him a toy locomotive as a present in exchange, the Warlock befriends Kris as his appearance changes. To repay him, he teaches Kris how to use magic snowballs to see anywhere in the world. This re-unites Kris with Jessica who informs him that the Burgermeister has banished all the toys and the children now want new ones. Kris promises to do so if the children behave themselves, promising to watch them through his magic snowball. When the Burgermeister hears that Kris means to bring more toys, he orders all doors and windows to be locked before their houses are searched. But Kris enters by the chimneys where the children hung their stockings to dry by the fire where Kris hid the toys. Thereafter the Burgermeister sets a trap for Kris as he makes another delivery, and thus captures the Kringles, Topper, and Winter. Jessica pleads to release her friends, but he refuses. Jessica then asks Winter to break everyone out, but he is unable to help them, since he has no magic left except some magic feed corn to make reindeer to fly. With the reindeer's help, the Kringles, Kris, Topper, and Winter escape. After months as an outlaw, Kris returns to the woods, where he grows a beard as a disguise. After Tanta suggests that he return to his birth name "Claus" for safety, Kris marries Jessica on Christmas Eve and the group travels to the North Pole to build their own castle and workshop. As the years pass, Kris still has to travel by night because he's still an outlaw. Eventually, the Burgermeisters died off and fell out of power and their laws were abolished. The townspeople then look up to Kris and eventually canonize him as a saint, becoming Santa Claus while Jessica becomes Mrs. Claus. Santa then decides to limit his journeys to one night a year and chooses the right night. Christmas Eve, "the night of profound love." Just as Santa is getting ready to leave, Winter tells him that he has his magic powers back to guarantee the world a white Christmas. At the end, after S.D. Kluger explains Santa's true meaning, he remembers that he still has to deliver the children's letters to Santa. He leaves for the North Pole joined by Topper, Winter, the Kringle family, and a parade of children singing "Santa Claus Is Coming to Town" during the credits. As they finally reach Santa's workshop, we see Kris and Jessica's shadows inside their castle. Santa steps outside and waves goodbye to the viewers as a group of children say, "Merry Christmas!" Based on "Santa Claus Is Comin' to Town" – © Leo Feist Inc. N.Y.
Design – Paul Coker, Jr.
© 1970 Videocraft International, Ltd. 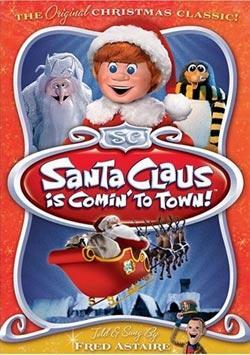 Released by Rhino on October 1, 2002, the soundtrack for Santa Claus Is Comin' to Town is available along with that of Frosty the Snowman, the Rankin-Bass special produced the previous year in 1969. This edition contains the full dialogue and all songs for both specials. Beginning in 1989, the special has been released numerous times on VHS and DVD. The 2005 DVD release included a CD single of Mariah Carey performing the title song. The special is also available as part of a DVD box set with other Rankin-Bass Christmas titles including Rudolph the Red-Nosed Reindeer, Frosty the Snowman, and Frosty Returns. In 2010, the special was released in the same box set on Blu-ray Disc. In 2015, both the special and Frosty the Snowman were released on Blu-ray Disc/DVD combo packs in the 45th Anniversary Collector's Edition. A novelization (an oversized children's hardback) of the special was published by Running Press Book Publishers in 2008. The script was adapted by Sierra Harimann with watercolor illustrations based on the original show by Mike Koelsch. There are some additional details in the book, although it is unknown if they are from the imagination of the author or were based on the original script. The Dismal Forest is at the foot of the Mountain of the Whispering Winds. The little girl and boy Kris meets when he arrives are named Annette and Andy. The Sombertown Dungeon was built like a fort with a courtyard in the center, and it is there that the reindeer land to rescue everyone. A video game based on the film was released on November 8, 2011 for the Nintendo DS and Wii.